There are many steps that go into the development of a schoolwide standards-based grading system. At Murray Hill Academy, the Eskolta team has been working with department heads to launch a new system of rubric creation. In the past, every teacher in the building had been using different rubrics for grading students, and there was little consistency between classrooms and no system in place for collaborating on grading practices. This year, Eskolta worked with teachers and leaders at Murray Hill to create a process for streamlining rubric development so that every single teacher at Murray Hill was following the same steps and using the same language when creating rubrics for student assessment. The new system, which teachers and building leaders refer to as an “ecosystem,” uses a Google spreadsheet as a tool for the development of shared rubric criteria that incorporated both Common Core Learning Standards as well as standards specific to the goals of Murray Hill. Every single person in the school had access to this document and could go in and flesh out criteria for different standards. As a result, now when a teacher needs a rubric for an assignment, they can go into the “ecosystem” and search for a standard that applies to their assignment. The appropriate language will pop up, and the teacher can then cut and paste it into the rubric they are creating. 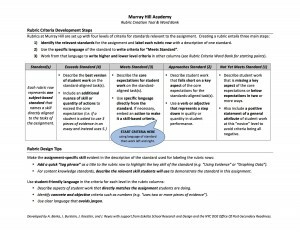 If another teacher is creating a rubric for the same standard, they will pull the same language and be communicating consistent expectations to students.